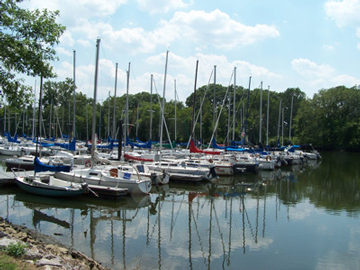 The largest sailing marina in the Washington area, the marina at Daingerfield Island offers services for experienced sailors as well as sailing lessons. The marina has water and land storage for boats, a public boat ramp, rentals of sailboats from spring to fall, and bike rentals all year. A retail shop, "Spinnaker 'n' Spoke" has a variety of sailing and cycling supplies, books, magazines, beverages, and gifts. The sailing school operated by the Potomac River Sailing Association is the largest certified sailing program on the East Coast. It has taught thousands of sailors both basic and advanced sailing techniques in the Potomac adjacent to National Airport. Triple Craft Restaurant is a restaurant featuring "craft burgers, craft shakes, and craft beer." The cafe has carryout sandwiches and seating indoors and on a deck overlooking the Potomac. The restaurant is also a popular spot for Sunday brunch. For information and reservations, call 703-548-0001.